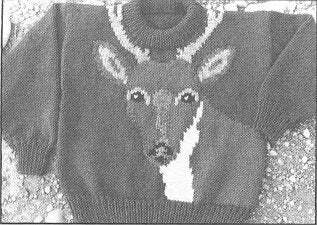 THE WHITE TAILED DEER 085-086-087 eweCanknit pattern. Child's sizes 2-6 knitting pattern : chest size 22-24-25 1/2 inches. Finished measurements 26-28-30 inches. Uses worsted weight yarn. 5 sts/inch. Youth sizes 10-12-14 and adult sizes S [30-32 in. ], M [34-36 in.] L [38-40 in. ], XL 42-44 in.]. Finished adult measurements 40-52 inches. Adult pattern uses bulky/chunky yarn. Design is on front and back. Uses graphs for design. This is a paper pattern not a download. More than one pattern can be sent for the same postage.